Trenbolone 50 mg Dragon Pharma trenbolone acetate is an anabolic steroid used in bodybuilding to increase strength, endurance and build muscle. It is desirable to combine the drug with other steroids, which will lead to higher results in weight gain. The optimal dosage of injectable steroid is 35-150 mg per day, many athletes prefer 50-100 mg. The maximum effect of the reception is achieved at a dosage of 100 mg per day, less than 50 mg taken with hypersensitivity to the drug. 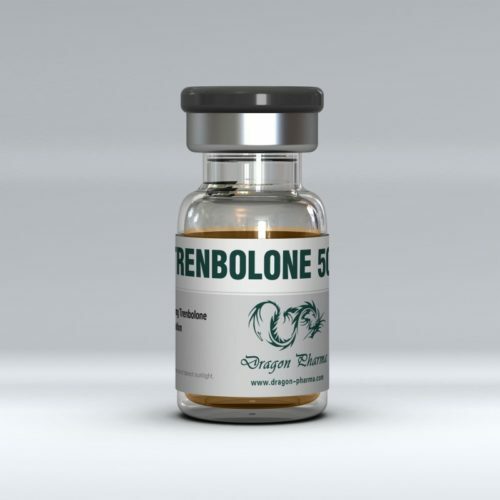 Trenbolone acetate is administered once a day. Since the steroid is not taken solo, trenbolone acetate gives an excellent effect with testosterone, dianabol and anadrolone. Acceptance of 50 mg of trenbolone acetate and 50 mg of dianabol leads to an impressive set of muscle mass. The increase in lean muscle mass and strength provides a course of trenbolone acetate and stanozolol. The main side effects that occur when taking the drug are: increased aggression, sweating, coughing episodes, the appearance of problems with tendons, decreased libido and frequent mood swings. Online store iron-shoulders.com guarantees the quality of the drug, anonymity and reliability of delivery.